Saint Camillus de Lellis, M.I. The memorial tablet in the main courtyard of the Ca' Granda, in Milan. Camillus de Lellis was born on May 25, 1550, at Bucchianico (now in Abruzzo, then part of the Kingdom of Naples). His mother, Camilla Compelli de Laureto, was nearly fifty when she gave birth to him. His father was an officer in both the Neapolitan and French royal armies and was seldom home. De Lellis had his father's temper and, due to her age and retiring nature, his mother felt unable to control him as he grew up. She died in 1562. As a consequence he grew up neglected by the family members who took him in after her death. Tall for his age, at 16 De Lellis joined his father in the Venetian army and fought in a war against the Turks. After a number of years of military service, his regiment was disbanded in 1575. Having gambled away all his possessions, De Lellis took work as a laborer at the Capuchin friary at Manfredonia; he was constantly plagued, however, by a leg wound he received while in the army, which would not heal. Despite his aggressive nature and excessive gambling, the guardian of the friary saw a better side to his nature, and continually tried to bring that out in him. Eventually the friar's exhortations penetrated his heart and he had a religious conversion in 1575. He then entered the novitiate of the Capuchin friars. His leg wound, however, had continued to plague him and was declared incurable by the physicians, thus he was denied admission to that Order. He then moved to Rome where he entered the San Giacomo Hospital, possibly founded by the Colonna family and dedicated to cardinal Giacomo Colonna (uncle of the founder Giovanni Colonna), which cared for incurable cases. He himself became a caregiver at the hospital, and later its Superintendent. In the meantime, he continued to follow a strict ascetic life, performing many penances, such as constant wearing of a hairshirt. He took as his spiritual director and confessor, the popular local priest, Philip Neri, who was himself to found a religious congregation of the Camillians and be declared a saint. Thus De Lellis established the Order of Clerks Regular, Ministers of the Infirm (abbreviated as M.I. ), better known as the Camillians. His experience in wars led him to establish a group of health care workers who would assist soldiers on the battlefield. The large, red cross on their cassock remains a symbol of the Congregation today. Camillians today continue to identify themselves with this emblem on their habits, a symbol universally recognized today as the sign of charity and service. This was the original Red Cross, hundreds of years before the International Red Cross and Red Crescent Movement was formed. During the Battle of Canizza in 1601, while Camillians were helping with the wounded, the tent in which they were tending to the sick and in which they had all of their equipment and supplies was completely destroyed and burned to the ground. Everything in the tent was destroyed except the red cross of a religious habit belonging to one of the Camillians who was ministering to the wounded on the battlefield. This event was taken by the Camillans to manifest divine approval of the Red Cross of St. Camillus. Members of the Order also devoted themselves to victims of Bubonic plague. It was due to the efforts of the brothers and supernatural healings by de Lellis that the people of Rome credited de Lellis with ridding the city of a great plague and the subsequent famine. For a time, he became known as the "Saint of Rome". De Lellis' concern for the proper treatment of the sick extended to the end of their lives. He had come to be aware of the many cases of people being buried alive, due to haste, and ordered that the Brothers of his Order wait fifteen minutes past the moment when the patient seemed to have drawn his last breath, in order to avoid this. In 1586 Pope Sixtus V gave the group formal recognition as a congregation, and assigned them the Church of St. Mary Magdalene in Rome, which they still maintain. In 1588 they expanded to Naples and in 1594 St. Camillus led his Religious to Milan where they attended to the sick of the Ca' Granda, the main hospital of the city. Pope Gregory XV raised the Congregation to the status of an Order, equivalent with the mendicant orders, in 1591. At that time they established a fourth religious vow unique to their Order: “to serve the sick, even with danger to one’s own life." Throughout his life De Lellis' ailments caused him suffering, but he allowed no one to wait on him and would crawl to visit the sick when unable to stand and walk. It is said that Camillus possessed the gifts of healing and prophecy. He resigned as Superior General of the Order in 1607, but continued to serve as Vicar General of the Order. By that time, communities of the Order had spread all throughout Italy, even as far as Hungary. He assisted in a General Chapter of the Order in 1613, after which he accompanied the new Superior General on an inspection tour of all the hospitals of the Order in Italy. In the course of that tour, he fell ill. He died in Rome in 1614, and was entombed at the Church of St. Mary Magdalene. Camillus was beatified by Pope Benedict XIV in the year 1742, and canonized by him four years later in 1746. Popularly, Camillus is the patron saint of the sick, hospitals, nurses and physicians. His assistance is also invoked against gambling. His mortal remains are located in the altar in the Church of St. Mary Magdalene in Rome, along with several of his relics. Also on display is the Cross which allegedly spoke to Camillus, and asked him, "Why are you afraid? Do you not realize that this is not your work but mine?" which has become the motto associated with St. Camillus, as well as healthcare workers who were inspired by him. The Congregation of the Servants of the Sick of St Camillus, the Daughters of St. Camillus, the Secular Institutes of Missionaries of the Sick Christ Our Hope, of the Kamillianische Schwestern (Camillan Sisters) and of the Lay Camillian Family, were born later of the charism and spirituality of St. Camillus. 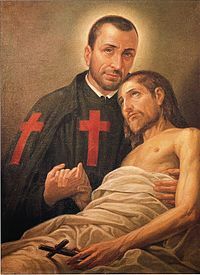 St. Camillus' feast day was originally inserted in the General Roman Calendar in 1762 for celebration on 18 July, since 14 July, the day of his death, was at that time taken by the feast of Saint Bonaventure. It was then given the rank of Double; later, it was changed in 1960 to that of "Third-Class Feast", and in the liturgical changes of 1969 to that of an optional "Memorial", when it was also moved to the anniversary of his death, 14 July. In the U.S.A. it is currently an optional Memorial celebrated on 18 July, because on 14 July there is the obligatory Memorial of St. Kateri Tekakwitha. ^ "About Us | The Centers at St. Camillus". Retrieved 2019-02-10. This article incorporates text from a publication now in the public domain: Herbermann, Charles, ed. (1913). "St. Camillus de Lellis". Catholic Encyclopedia. New York: Robert Appleton. Wikimedia Commons has media related to Camillus de Lellis. Website of the Camillians in the U.S.A.
Saint Camillus de Lellis at the Christian Iconography web site.